The government in Kuwait has announced that it will not impose any penalty, on Indian workers, who are forced to stay longer illegally, because of non-payment of salaries. This has come as a relief to many of them. The amnesty will be given for a period ranging from January 29th to February 22nd. Many Indian workers are passionate to use the amnesty and are enthusiastic to return home. They will visit the Indian Embassy in Kuwait, and submit all relevant details, to enable their return. The penalty, when a person overstays in the country, is two Kuwaiti Dinars, per day, equivalent to Rs 424/-. The workers remained unpaid and had overstayed for several months. They were not in a position to pay such fine. The granting of this amnesty by the government was the result of the recent visit of VK Singh, Union Minister, External Affairs, to Kuwait. He had discussed the issue of the salary of workers remaining unpaid by Kharafi National Company. He held a dialogue with a minister in Kuwait to waive the penalty for the workers who wished to return to India. 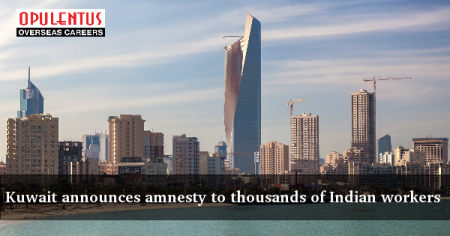 The amnesty empowers the workers to go back to Kuwait again, in a legal manner and hold jobs. In a positive development, workers from India who were employed with Kharafi National, and also those who had left their jobs upon denying the salaries, have received an offer from the company. The representative of the company had offered part of the salary due to the workers. The workers have not responded to this offer, as they aim to receive the entire dues. Some workers wish to use this amnesty, to return without receiving a salary, because they are desperate, to see their families in India, and wish to avoid uncertainty.